Taylormotive is the top company when you need collision repair North Vancouver. The following is an outline of what to expect in the collision repair process from work estimate to completion. A preliminary collision repair estimate is completed to include the damage that can be seen prior to vehicle disassembly. Quite often an accurate estimate of total cost of repairs cannot be completed until the car is fully disassembled by our auto repair shop in North Vancouver. If an insurance claim is being made, we will take supporting pictures and measurements at this time. A work order must be signed by the owner of the vehicle. The form is usually signed when the vehicle is being dropped off for the collision repair appointment at our collision repair shop in North Vancouver. If the car is not drivable and is being towed to our facility, we will still need a signed work order prior to commencing collision repairs. For insurance claims, additional pictures and an updated estimate will be sent to your adjuster for approval. If the repair is being paid personally, we will call you to get approval for repairs to the hidden damage. Any additional parts that are required for completion of the repair will be ordered at this time. We will contact you to update you on the repair status of your car. At this time, we will have a close approximate date as to when you should expect your car to be returned to you. The first step of the auto repair process is the structural and body alignment. Frame straightening, sheet metal alignment, and parts replacement are done at this time. 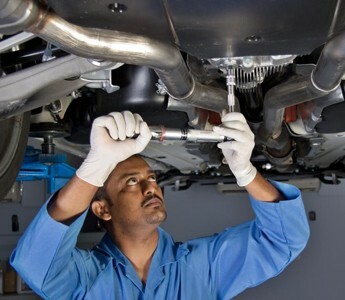 Mechanical and sublet repairs are scheduled once the repairs to the frame and body of the vehicle are completed. This includes repairs to the engine, suspension, and interior panels. Depending on the extent of the damage, these repairs can sometimes carry over until after the car is painted. During this phase, the affected body panels are prepared for paint including applying primer, sealer, and corrosion protection. We use Sikkens™ paint, a top quality water-based paint that is also very environmentally friendly. After the vehicle is painted, the final assembly is performed. This will include installing any parts that were removed to facilitate the repair process. Once the car is fully reassembled, we conduct a final inspection of the car. This could include aiming the headlights, checking window functions and a repair quality inspection. The computer wheel alignment can only be done after the car is reassembled. It is important that the vehicle is at the correct weight distribution. We use our computerized alignment machine to detect damage that would not be found with a visual check. If additional damage is found, a new estimate is prepared with supporting pictures and sent to your adjuster for approval. We will call you to update you on the repair of your car, as this is the most common time for a change to your repair completion date to happen. After all the damage is identified and the collision repair is complete, we will complete a final inspection of the car. The car is cleaned at this time, and made ready to be picked up by the customer. We guarantee that all repairs performed under your repair order number will be completed to generally accepted standards. This guarantee protects against defective workmanship or materials. Coverage for damage caused by or resulting from unreasonable use, maintenance or care of the vehicle is excluded. The guarantee is valid for as long as you own the vehicle. Contact Taylormotive today to arrange for an estimate and an appointment to begin your collison repair in North Vancouver.